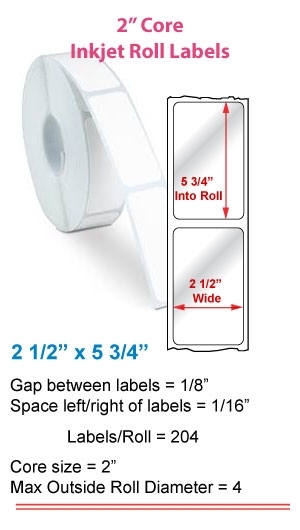 ROLL OF 204 CONTINUOUS 2.5" x 5.75" LABELS - USE FOR PRIMERA LX400 & LX500 INKJET ROLL LABEL PRINTER - NO PERF - Labels on a roll with a 2" core. Available in White Uncoated, ViVidGloss, Brown Kraft and PolyGloss. All label materials have a permanent adhesive. White Uncoated is best described as your everyday printing paper. It has a porous smooth white surface with no shine to it at all. Our White Semi-Gloss material is designed for those that want a glossy look at a lower cost than the High Gloss product. Our Semi-Gloss material has a softer whiteness and less of a shine than our high gloss product. Print will be somewhat smear-resistant but not to the extent of our high gloss. Our whitest and shiniest material, ViVidGloss's coating is made for high dpi and photo printing. White ViVidGloss holds the ink pattern of each individual dot of color, creating a superior image. ViVidGloss is extremely water- resistant but it is a paper material. If you are looking to label a product you sell, this would be a perfect choice. Brown Kraft material has a rustic and aged look to it and is best described as a slightly darker version of a paper grocery bag. This material prints really well but the darkness of the paper may cause some light colors to become harder to see. Brown Kraft is a great material for label handcrafted material that you want to give a rustic primitive look to. White PolyGloss is our 2 mil white BOPP film with a glossy finish that locks down dye based inks. PolyGloss is our shiniest and most water-resistant label. It has photo quality printing, freezer grade adhesive and can get wet without smearing. While no label is smear or waterproof unless laminated or varnished, our PolyGloss is the next best thing. Samples available upon request using our Contact Us Page.